We’re getting a lot of rain and wind from Hurricane Sandy here in Toronto – as in, it’s raining every single day this week. I looked at the weather app on my phone the other day, and while I do love rain, I’m not sure I love it enough to deal with it every day. When it’s raining, and cold, I love to indulge in chili. It’s so comforting and flavorful and keeps you warm. I think it’s safe to say that it’s my favourite Winter meal. About a month ago, I was invited to an event at Whole Foods Market in Yorkville where I got to taste their amazing Thanksgiving prepared foods. It was on this day that I learned one important thing about myself. I’m not a vegan, but if I were to become a vegan, I would eat their Vegan Pumpkin Pie every single day. Other than tasting the yummy foods, the bloggers were asked to participate in the Blogger Gobbler Challenge. And I love a good challenge. We were given two secret ingredients – a la Iron Chef style – sweet potatoes and balsamic vinegar. The possibilities were endless but I could only think of one thing – chili. So I made a Vegetarian Chili that is so good you won’t even miss the meat and it’s packed with so many delicious vegetables I guarantee you will feel fabulous after this one. This chili is also vegan, but I like to add a lot of sour cream when serving because I’m that kind of girl. In a large pot, heat oil over medium heat. Saute onions and garlic for 3-5 minutes or until softened. Add in spices and herbs, stir and cook for 1 minute. Add all vegetables, cook stirring occasionally for 10 minutes. Add balsamic vinegar, crushed tomatoes and water. Bring to a boil. Turn down heat, cover and simmer for 10 minutes then simmer uncovered for 15-20 minutes or until vegetables are tender. Stir in chipotle hot sauce and season with salt and pepper. Serve piping hot with a dollop of sour cream. I hope everyone stays safe during the hurricane and if you have power, I highly recommend making this Vegetarian Chili. 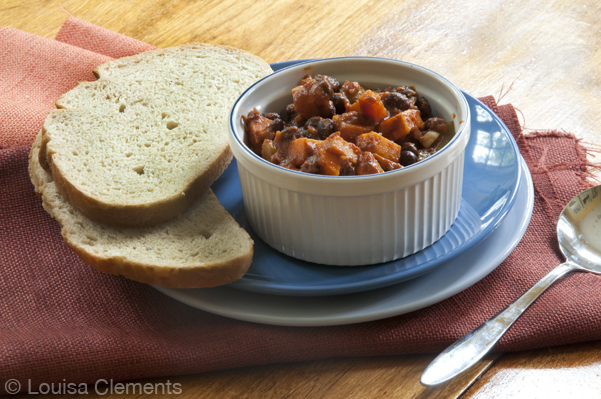 I love chili and am excited to try this vegetarian recipe. Thanks for posting! I try to have at least one meatless meal every week. This chili looks amazing! I'm definitely going to try it.